We are a social carpooling service that matches passengers to everyday drivers who are going along the same way. Hitch drivers are regular car owners who choose to ‘tumpang’ you on their way to their destination in exchange for a fare meant to subsidise petrol cost. 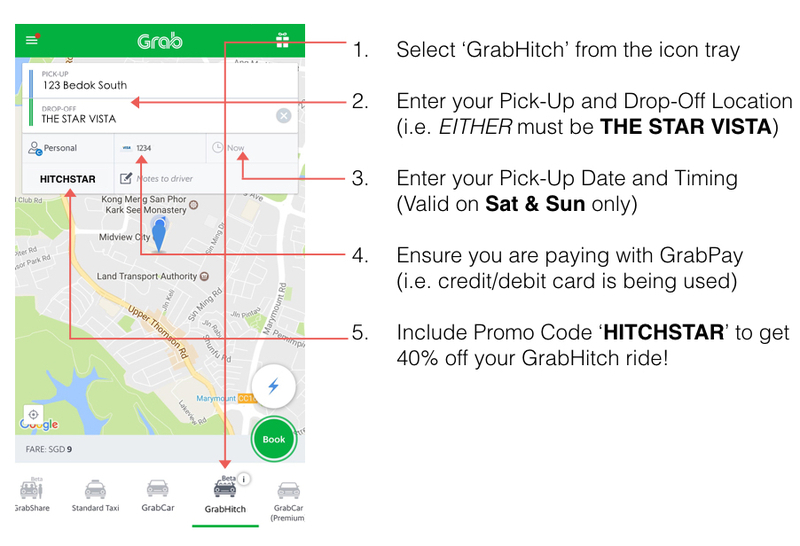 Why should you take GrabHitch? Meet people from all walks of life – share interesting conversations and life experiences! GrabHitch prices are fixed by distance and unaffected by demand or peak hour timings. Affordable private-car commuting option, 20-40% cheaper than other commercial services. You can even schedule your ride up to 7 days in advance with no additional charge. Contribute to Singapore’s car lite movement, help to ease traffic congestion and reduce carbon footprint. This promotion is valid for new GrabHitch riders using GrabPay only. Bookings have to be made for rides between 08 April 2017 00:00 hours to 30 April 2017 23:59 hours to qualify for the promotion. Eligible for passengers who have never completed a GrabHitch ride before. Limited to the first 1000 redemptions per calendar day. Have questions? Email us at grabhitch@grab.com with subject “Hitch Star Vista” and we will get back to you in 2-3 business days.